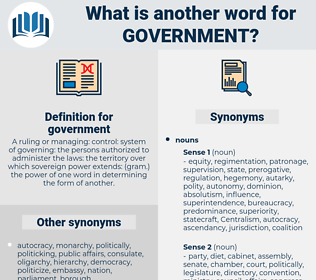 What is another word for government? 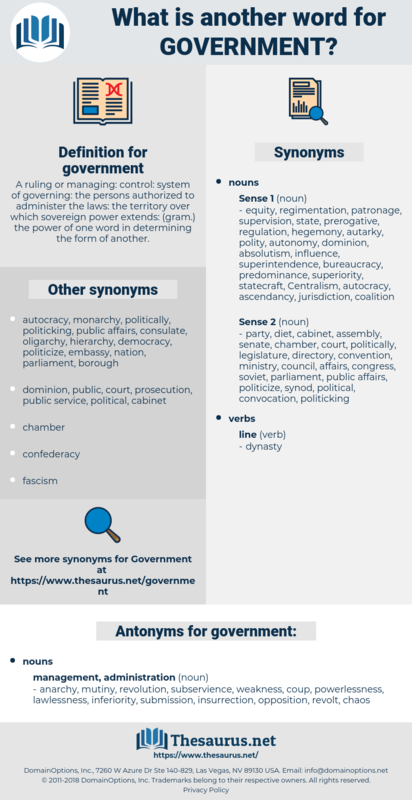 A ruling or managing: control: system of governing: the persons authorized to administer the laws: the territory over which sovereign power extends: ( gram.) the power of one word in determining the form of another. GOS, servants, entrepreneurs, organisms, Minorities, Telecommunications, appropriations, inspectors, participants, campaigns, Entities, reductions, Measures, Languages, structures, partners, projections, Forms, FEDS, citizens, media, TBS, expenses, preferences, Refugees, stakeholders, Drugs, Trustees, Standards, facts, highways, challenges, pressures, loans, results, aspects, bonds, Les, buildings, lakes, Persons, Has, men, pounds, women, heads, claims, governement, gouvernment, GOVT. reforms, Clients, restrictions, Categories, implications, outcomes, stages, rulers, sides, individuals, Penalties, Universities, options, Lives, skills, functions, transcripts, servants, Languages, FEDS, stakeholders. appointed, Was, Were, included, Had, decided, said. going, Removing, existing, being, Establishing, Having, according, living, building. supported, Been, Introduced, used, contained, detailed, Provided, estimated, given, considered, adopted, employed, renewed, Had, decided, elected, signed, made. brings, takes, attaches, Does, Has. Its, authorities, cabinet, governance, governmental, governing. anarchy, mutiny, revolution, subservience, weakness, coup, powerlessness, lawlessness, inferiority, submission, insurrection, opposition, revolt, chaos. The truth is that I did the Government a service. Mr. Lambert would go to his government: and who would go with him?